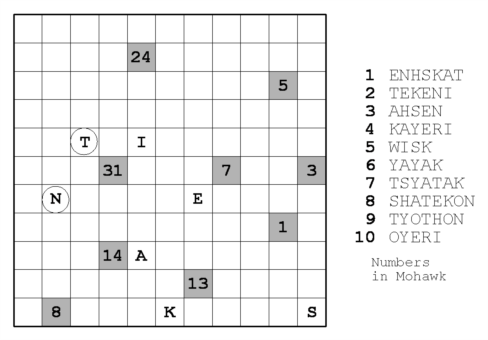 Rules: Draw a snake of letters in the grid, whose head and tail are given in circles and that doesn’t touch itself, not even diagonally. Avoid grey cells with numbers. The snake must be formed only of the worded form of numbers (as written in the given word list) in any order, starting from the head, moving along adjacent squares and ending on the tail (and NOT the opposite). A number on a grey cell gives the total value of the worded numbers that pass through its neighbouring cells, including the diagonal neighbours. You don’t need to use all the words but you can use each word only once. Background: This is one of my inventions. When I was an inexperienced puzzle maker I had a chance to prepare a set of puzzles for 24 Hours Puzzle Championship, 7th 24 HPC/2006. I didn’t exactly know how to construct a puzzle set – like puzzle difficulties, puzzle types. But I think that I wanted to make my part different with puzzle types. So I invented some types, Sigma Snake is one of them (actually, I was inspired by Cihan’s Monthly Python). At the end, that set was awful! Really awful! Sorry Michael again! 🙂 If I get any courage , I’ll publish the set here in the future. That one is my second international attempt in puzzle area. 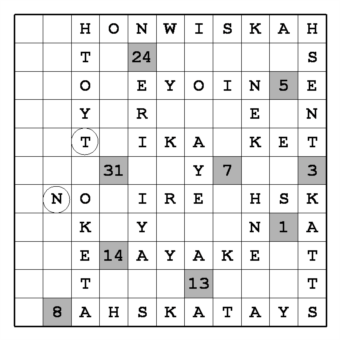 Anyway, you can see my first Sigma Snake which appeared in 2006, 7th 24 HPC: Puzzle, Solution. I made so many Sigma Snake puzzles so far, maybe I can share some links that point to them: Snake Variations Contest 1, SVC 2, OAPC 1, Best of OAPC (OAPC 10), ZeKa 2011 etc. Bu yazı Instructions içinde yayınlandı ve 24 HPC, PQRST, puzzle, Sigma Snake, WPC olarak etiketlendi. Kalıcı bağlantıyı yer imlerinize ekleyin.